Starting from the upper left corner, that is the print which came attached to the build plate as a sample from the factory. Next to the right is my local demo print. Not too bad so far. But then the next print (the rook) is leaning to one side and the plastic looks very distressed. Those first 3 prints were with Tiko GEM filament that came with the machine. I switched to orange PLA from MakerBot. The Make Robot test piece failed in about the same place both times. The filament jammed in the Bowden tube and had to be removed manually. Next is a try with red translucent MakerBot PLA – got further but still no success. And the rats nest to the right in the middle row is back to Tiko GEM PLA and was supposed to be a rook. The rotor keychain on the bottom right failed to complete too – this was with M3D Cobalt Blue PLA. The white part in the middle also failed and was Polymaker PolyMax PLA. 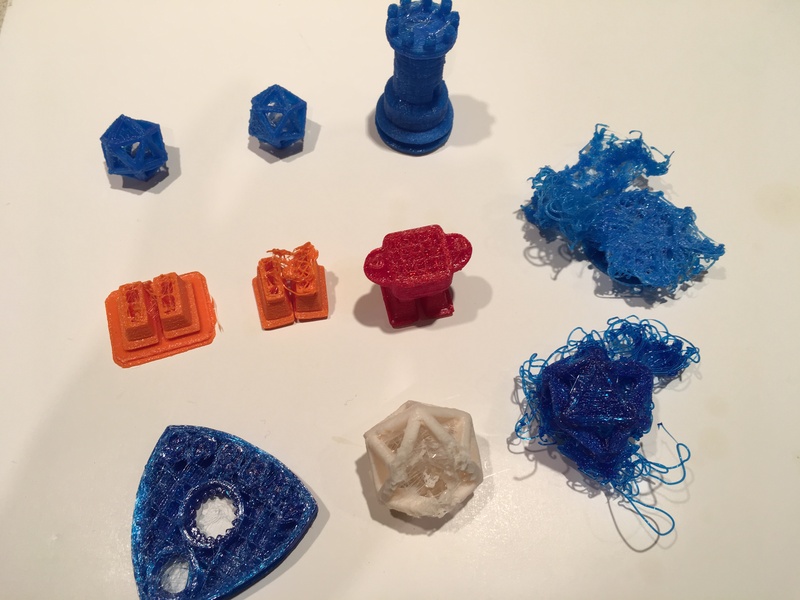 Finally, the last one on the right was back to M3D Cobalt Blue PLA – a larger try of the demo part it started with at the top. In every case but for the one rook, the filament jammed behind the extruder nozzle. Removing the filament manually I found in every case that heat creep and softening of the filament 1.5″ – 2″ above the tip caused a plug to form. The extruder gear then would grind off the filament and the whole thing had shut down – no more extrusion. This led me to wonder just what the temperature of the nozzle was really. Although I set it to 205C in their WIT control interface, all the evidence pointed to something wrong on the high side. And now you see why – my FLIR thermal camera is showing the tip temperature when I merely selected “heat nozzle.” And when printing (set for 205C! )here is what I got – a whopping 270C! Note that this design uses a PTFE Bowden tube to the head and no true active cooling of the extruder itself. PTFE softens at 247C or thereabouts, and by 270C is all but useless. Not to mention that PLA is not going to survive in the heat break area above because eventually it will significantly soften there. This is exactly the behavior I was getting. What to do? Thankfully there is a recovery panel where you can force the machine to recalibrate the heater. I decided to try this – and the change in results was immediate. I was able to print to completion the Make Robot and the demo sample but now a new problem is evident – layer shift. You can clearly see this in the letter “M” on the Make Robot piece. Why the shifts? While not clear at this point, it appears to be a mechanical problem. One theory is that an axis motor gets stuck with the interfering Bowden tube. It sure seems to be too long. Another is that the control arms are too flimsy and bend when warm. They clearly seem too flimsy to me, but som e bloggers think this is a deliberate choice. Deliberate or not, the mechanical integrity of this 3D printer is in question, and many users are reporting this issue. A third possibility mentioned is the slicer. I might collect the gcode for the Make Robot and put it into a visualizer to see if indeed the math is wrong somehow and the machine is just doing what a corrupt slicer is saying to do. BTW the hot-end heater has no thermistor or any means of direct temperature measurement by the controller. They are relying on the DC resistance of the heater and then controlling the current into it based on some translation in the firmware. There are no other wires coming from the heated end other than the digital accelerometer (used to determine leveling and mounted on the Bowden tube well above the hot end) and the two wires for the heater. And in an October Kickstarter update, they discussed “solving” the jams caused by this heater. This type of design is called a “self-regulating” heater, and these are most often applied where a specific target temperature is to be achieved. The best example application is the heat tape you use for deicing a downspout or gutter in winter. It is certainly novel for a 3D printer, and from my engineering point of view a poor choice for a low-cost machine. Temperature regulation needs to be precise and dynamic at the hot end – and this one has a very low mass – thus little “stored” heat to level things out. So I ran two more test parts after the heater recalibration – and the second completed but clearly showed the start of jamming half-way through due to overheating behind the hot end. So for now my plan is to put it back in the box and wait to see if some update is offered that gets the quality issues solved, assuming that actually can be done! While there are a number of suggested modifications on the discussion areas, I intend to keep my machine “stock” for now. There was a promised update for the web interface and the firmware today, and yes indeed, powering it up it got it just fine. Remarkably, at least for my machine, the update actually made it work tremendously better – it actually got through a long print (3 hrs.) without a layer shift or jam. Still stringy though…. and yes, now rafts seem a bit harder to get separated as some on their forums have mentioned. I’m not using the GEM filament that came with it – it is getting discarded… but I’m keeping the spool and refilling it with something of known pedigree that works in other machines. I have some empty MakerBot Mini spools which fit nicely though they hold perhaps only 35% of the Tiko-supplied full spool. However they are smoother running because there is less pull needed to move the filament. I’ll update with some pictures of the new parts soon. OK, the long overnight print sort of failed… about halfway through the LFS Elephant (http://www.thingiverse.com/thing:257911) there is a clear reduction in extrusion rate, and while it did complete the build, the top-most layers are largely webs instead of solid skins. I reduced the temperature to 200c for that job (based on how things were looking on the first set at 205c), but I’ve now changed filament again and am running a low-poly squirtle with transparent red pla at 205c. The gallery above shows the progression of extrusion from a reasonably good layering to the failed region. The first image shows the bottom area of the LFS Elephant. The second picture shows the clear transition from acceptable to low / loss of extrusion. The last picture was taken in monochrome at the last and top-most layers. Clearly the filament is no longer being extruded to match the machine’s movement rate. These pictures were taken with a Celestron FlipView digital microscope at lowest magnification. As I hinted at earlier, the signs of business failure were becoming evident. And now if you check the project comments you’ll discover that indeed the Tiko project is in very deep distress. Despite promises, as these things tend to go I do not expect there will be refunds to folks who have preordered one or any more batches to be manufactured and sent – nor warranty support to those who were fortunate enough to be in the three batches that did get delivered (1 for Canada, 2 for US). With Monoprice to offer a $149 delta printer soon with practically the same build volume, touchscreen and WiFi control – the Tiko is simply too little too late. So another Kickstarter 3D printer project goes crashing – the success rate of 3D printer offerings on crowdfunding would be interesting to determine – I’d guess only about 1/3 – 1/2 actually deliver. As far as the Tiko goes, whatever community springs up to be the unofficial support will determine its ultimate usefulness. For now, I don’t have the time to delve into modifications and improvements. And if all else fails, I’ve got an interesting WiFi controlled desk lamp! “Despite the year and a half of hardware and software setbacks, manufacturing challenges, repeated delays, regulatory hurdles, unending certification requirements, unplanned operating expenses, logistical nightmares, sleepless nights, strained relationships, frustrated suppliers, a disgruntled community, new competitors, and a jaded industry, we simply refused to give up. Day after day, we kept fighting with all our hearts. Evenings. Weekends. More engineers. More developers. More prototypes. More testing. Nothing was ever enough. We did everything we could to turn this around, but by November 2016, we were at a breaking point. With resources running thin, and options running out, we prepared for one final push. We believed software improvements could solve the remaining technical issues, and that pre-orders could solve our financial ones. It was our big chance to get back on our feet. Of course, that status was not reflected in the updates last year.